Handling your hamster is one of the enjoyable benefits of owning him. As long as you've properly socialized him, your hamster should be pretty eager to cuddle and play with you. Many new hamster owners don't realize that hamsters do carry bacteria. Playing with your hamster can make you sick if you don't take proper sanitary precautions after interacting with your pet. Salmonella bacteria is best known as a food contaminant, but it's borne in some live animals, not just in things you eat. According to the Humane Society of the United States, hamsters have been found to carry salmonella bacteria; contact with an affected hamster can cause a healthy adult to become ill. The Center for Disease Control and Prevention reports that 42,000 cases of salmonella infection occur in the United States every year. Symptoms of salmonella infection typically occur within 12 to 72 hours of exposure to the bacteria and include severe stomach upset, diarrhea, vomiting, abdominal cramps and fever. Your hamster will likely appear completely healthy even if he naturally carries salmonella bacteria. You can not identify a hamster that has salmonella bacteria present in its feces by looking at it. Since hamsters shed the bacteria in their feces it is easy for the bacteria to wind up in their cage or on their fur. Hamsters do groom themselves by licking their paws and combing through their fur with them, but this type of natural grooming does not kill bacteria. Experts discourage bathing hamsters with soap and water; a chill can make your hamster ill and kill it in short order. Bathing a hamster strips him of oils that hold in warmth, exacerbating the result of a wet chill. The easiest way to avoid coming down with salmonella poisoning is to practice safe, sanitary hamster care. Always wash your hands with antibacterial soap and water before and after playing with your hamster. Keep your hamster away from places where you prepare food. Don't eat with your hamster. Wear gloves when cleaning out his cage and make sure to use a disinfectant soap on his toys and cage. Never touch your mouth while playing with your hamster. 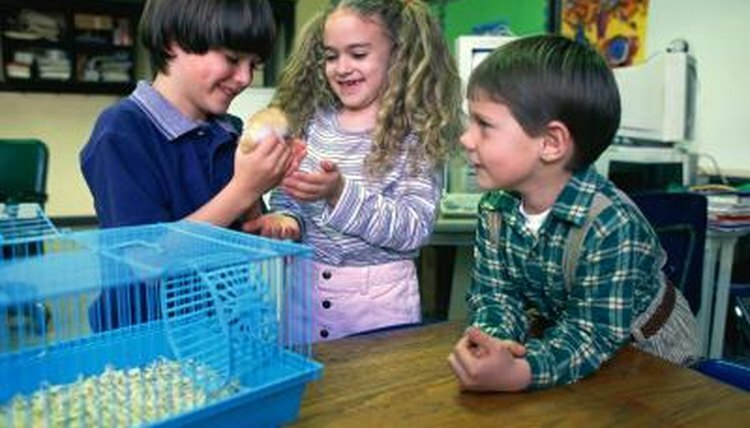 Supervise young children to make sure they use good hygiene while handling hamsters. The elderly, children under the age of 5, and people with weakened immune systems are more likely to suffer serious complications if they contract salmonella from a hamster or other source. If you or someone in your home has health problems that would make contracting salmonella a serious health crisis, keep the person away from your hamster, or avoid owning hamsters and similar pets. The CDC classifies pets such as mice, hamsters, guinea pigs frogs, turtles, chickens and other as high-risk pets that likely will carry salmonella. Humane Society of the United States: Is a Hamster the Right Pet for You? Do Hamsters Need to Get Shots From Vets?